What problem was told to Ezra soon after they arrived in the land? Why was it a problem that they had married some people in the land? Where had commanded them about this? Why did God forbid them to intermarry with other peoples? What result would intermarriage bring? Which people were the chief culprits? Do you think there is any relationship between the leaders’ bad examples and the fact that many people did the same thing? Are we forbidden from intermarrying outside of our own nation today? Then what modern day principle can we get from this (do not marry unbelievers)? 2 Corinthians 6:17-18 – God wants us to be separate from other peoples (holy). Romans 12:2 – Do not be conformed to this world. 1 Peter 2:9 – You are a royal priesthood, chosen people, holy nation. B. Application: Leaders will be held responsible for their actions in front of God. Their actions don’t only affect them, but all of those under them. For any of us who ever have a position of authority, we need to make sure that we are a good model for those under us and follow God without compromise. This includes parents, teachers, bosses, leaders in the church, etc. 3. This was sinful because God had commanded them NOT to intermarry with the peoples of the land. This is not because the people of Israel were ethnically superior to others. It was because almost universally people of other nations were idol worshipers and committed a host of abominations in God’s sight. Marriage is the closest, most intimate relationship that there is. It is IMPOSSIBLE not to be affected and influenced by one’s spouse. God told the people that intermarriage with the other peoples would negatively impact their relationship to God. It would be a major impact to the point where the unbelieving spouses would drag the people’s hearts away from God and to false religions. This can be seen clearly in the life of Solomon and also with others such as Ahab and Jezebeel. Read Cross-References. Discuss for a while the problems of the Jews marrying people of other religions and also how that applies to Christians today. How did Ezra respond when he heard this? Was his response kind of extreme? Why or why not? What does tearing his hair and clothes and ripping out his hair show? What attitude does this show? How does that compare with how the people reacted to this sin (they had tolerated it for a long time)? How did his example affect the people around him? 1. Ezra had an extreme and visible reaction when he heard this news. It could almost be classified as a violent action. When some people saw him they might have thought he went crazy. What would you say? This reaction shows the level of his detest for the sin the people were committing. It also shows his shame and guilt since he was part of the group. He was extremely sensitive to sin and hated it. This is a very sharp contrast with the people of the land. They had lived with and tolerated this sin for some time. The leaders accepted and embraced it. There doesn’t appear to be any group or people who are reacting against this sin as Ezra is. 2. Tearing garments and ripping hair out were also signs of grief and shame at that time. Only people who had been utterly humiliated would do this. 3. Application: How do we respond when we see sin? How do we respond when people point out sin in our own lives? Do you find that you will generally tolerate sin? Do you ever react with the kind of extreme emotion we see Ezra portray here? Does sin grieve you like this? Do you feel ashamed like this? Does this depth of emotion motivate you to change or do you forget it and repeat the same mistakes? 4. In today’s society tolerance is considered to be on of the most important character qualities. You are supposed to tolerate anything and everything no matter how evil it is (Except Christianity of course! Satan is very clever and deceptive.) Live and let live! The media will tell people to accept all kinds of sins like adultery, fornication, and homosexuality. They will even promote these sins as acceptable lifestyles in the vast majority of TV shows. Characters go out of their way when talking about homosexuality to say “not that there is anything the matter with it.” Beyond that psychologists will try to alleviate the guilt and shame of their clients (caused by their sin) by blaming others and telling them not to focus on the wrong things they have done. I heard recently of a case where a professing Christian husband had an affair. The parents of both sides were believers. The wife’s parents beseeched the man’s parents (who were also Christians) to rebuke his sin and implore him to repent. For the sake of family “unity” and “peace” they declined and wouldn’t say anything to him about it. A. Sometimes it is easy to see these problems in the lives of others or as a general problem with our culture today. It could be harder to see the problem in our own lives. The more important question is not “does the world have a problem with tolerating sin?” It is, “Do I have a problem tolerating sin?” Each of us needs to examine ourselves. If there is any sin, we must ruthlessly root it out. We must hate sin like God does and never tolerate it in any form for even a second. 5. Whereas in the first verses of this chapter we saw that the leaders’ bad examples were a precedent for the people that they latched onto to feel comfortable while continuing in their own sin. Now we see what a difference a righteous leader can make. Ezra clearly and publicly reacted against this sin. He did not allow people to feel comfortable anymore while committing sin. Once he carries out this “demonstration” (Although I don’t think he was doing it with others in mind. It was a purely natural reaction because of his intense hatred of the sin), people start to gather around him. It serves as a rallying point for those who want to obey God. His example immediately stirred up crowds of people to join him in weeping over this sin. Why did these people not gather before? Why did these people not deal with this issue before? Whatever the reason, now that someone was leading them righteously, they did gather. They did care about it. They did want change. This is yet another reminder that we must use the position God has given us to lead righteously and take a stand against sin. We must never allow those under us to sin without deterrents or to be comfortable in their sin. As a father with two young sons, I am talking as much to myself as to anyone else. I consider it one of the parents’ most important duties to point out their kids’ sins and encourage them to repent. Why was Ezra so upset? Why did he feel humiliated? Considering he didn’t participate in this sin, why did he keep referring to “I” and “Our” etc.? Why did Ezra believe they suffered so many defeats in their recent history? Why do any believers face trials? Is it always because of our sin like in this case? 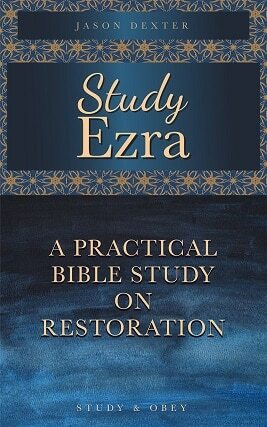 How had God shown His grace to them recently (can give a summary of the ways in the book of Ezra)? What does it mean “give us a peg in His holy place”? Where was this holy place? Why did God not completely abandon and destroy them for the many evils they had done? What can we learn from this section about people? What can we learn about God? What can we learn that we may need to apply ourselves, specifically in the area of prayer? Review: What command had God given them when they entered? Why? Did they have any defense/excuse before God for their actions? How did Ezra expect God to react? Would God have been justified in doing this? What was Ezra’s view of God (15)? What lessons can we learn about sin and confession from this prayer? Proverbs 28:13- Whoever conceals his transgressions will not prosper. 2 Chronicles 7:14 – If my people humble themselves, I will hear and forgive. James 4:8-10 – Draw near to God and He will draw near to you. Joel 2:13 – Rend your hearts, not your garments. Romans 11:25-29 – God’s promises to Israel would stand. 1. At the evening offering, I arose from my humiliation. Ezra was certainly right to grieve and weep almost to the level of despair over the sin that was being committed by the people of Israel and the dangerous predicament this left them in. But there is a point in time, when one has to start to take action to resolve the problem instead of lamenting the problem. It is understandable to grieve about it, but necessary to take action to move forward. See Philippians 3:12-14. What was the first thing Ezra did in moving forward and correcting this problem? 2. The first thing Ezra did was pray to God. He could have started given orders. He could have started rebuking the people. He could have started teaching the people. But he didn’t. Why not? Before there can be restoration with God there must be confession to God. One thing that strikes me while reading this passage is the level of Ezra’s humility. He fell on his knees and stretched out his hands to God (side question: should we pray on our knees?. He had already torn out his garments and ripped out his own hair. Next he admits to feeling shame and embarrassment because of the sin. He realizes that he is approaching God not as an equal. God is the Creator of the universe and he and the people of Israel are God’s unworthy subjects. He realized that he didn’t even deserve to come before God. True confession begins with sincere humility. 3. Another thing I noticed is that Ezra uses many personal pronouns. He uses “I”, “we” and “our.” He uses these pronouns even though he didn’t commit this particular sin. The obvious question is why? Simply put, he is one of the people. He is identifying himself as linked to the group. The prayer would also not seem nearly as genuine if he kept saying how evil the other Israelites were. While he had not committed this specific sin, he had committed many others so it was true that the entire nation was guilty in God’s sight. When one wants to confess to God there should be no blaming or pointing fingers. When people first sinned, Adam pointed to Eve and blamed her and Eve pointed to the snake and blamed it, but in fact they were both culpable for the sin they had done (although it was true that they had been influenced by others. MacAruthur says this, “Ezra understood that the sin of the few is sufficient to contaminate the many.” Now from God’s viewpoint He clearly does not hold one person responsible for the sin of others. Examples? Noah and his family. A father should not be punished for the son and vice-versa. Etc. Yet when we come to God in prayer we should come as the representative of our group (be it America, France, our Bible study group, or our family) and seek God’s forgiveness and blessing for the entire group. So here we learn another lesson about confession. True confession takes personal responsibility and doesn’t blame others. 4. Our iniquities have risen above our heads and our guilt has grown even to the heavens. Here we see a very visible picture of their sins. What does this picture demonstrate? The picture is of there sins rising up as cloud to the very throne of God. This cloud reaches all the way up to heaven and fills it with the stench of the people’s wickedness. This reminds me of one place I have passed a few times, a lovely pig farm. Every time I can smell them even from a distance. I try to hold my breath for as long as possible hoping to get past it before I need to breathe again. And every time I fail and have to inhale the horrible fumes. Any of you have similar experiences walking past city dumps and the like? Yeah, most of us have. And that is the picture Ezra paints of their sins in God’s sight. They rise up like a stench infecting his very presence. When we sin, sometimes we think God is far away. We may think He doesn’t see us or He doesn’t care or He is involved with more important things and doesn’t take notice of us. But He does. He is not a King who sits far away uninterested about His people. Each and every one of our sins, no matter how small, affect God and even grieve Him. When we see sin like this it is a reminder of God’s grace (that He doesn’t just wipe us out) and it is a motivation to live our life in holiness. So we learn that true confession acknowledges our sin as a stench that God hates. 5. Verse 7 – Here Ezra delves into Israel’s past history. He admits that their sin is not a new problem, it is a repetitive and continuous problem stretching for generations. Why is this important to admit? True confession acknowledges all of our past sins. 6. Verse 7 – Beyond that, Ezra realizes that all of the recent defeats they have faced from their enemies are a direct result of their sin in God’s sight. This doesn’t mean that all trials are the result of sin. As we learn in the story of the blind man in John 9, not ever affliction is the result of sin. There are many possible reasons for them. But in the case with Israel, God had already told them that this was because of their sin He was disciplining them. Many times (not always) people’s difficulties are the result of poor life choices. Marriages fail because of sin (of one or other or both sides). A son or daughter won’t speak to his parent many times because of the mistakes of that parent. A student fails an exam and misses a chance to enter college because he didn’t study hard. A family loses their home and everything they own because of poor financial decisions and getting into too much debt. A person goes to jail because of a lapse of judgment in which he drank too much, drove, and ran over someone. The list goes on and on. Can you think of any examples where your own sin/mistakes caused you a trial or hardship? Many times in these types of situations people would grow bitter. They would complain, get depressed, grow angry at other people, or even lash out at God. This is the wrong response. Instead of blaming others for our problems, we should realize that our own sin has brought us to this low, confess and seek to make right what we have done wrong. True confession realizes that sin comes with consequences. 7. God had been very gracious to His people. Although they committed a host of abominations in His sight, He didn’t destroy them or abandon them. He gave them a remnant and He allowed them to return to the land. His discipline was not permanent. In Ezra, we have seen many of the ways He blessed His people from giving them safety and protection, to moving the hearts of the kings to give them immense materials and riches, to moving the kings to make favorable laws and decrees for them. He worked providentially on their behalf over and over again. This was not deserved. It was grace. While God does discipline us when we do wrong, He is also willing to forgive us. When we know this, it will motivate us to confess quickly and seek God’s forgiveness without wasting any time. True confession recognizes and is grateful for the grace of God. 8. Verse 9b. While God did forgive them and extend His divine grace to them, they were not devoid of responsibility. He gave them some tasks to accomplish by which they could show their faith and the sincerity of their repentance. What tasks? Rebuilding the temple and the walls. As we have seen, this was not easy. They faced a lot of adversity. They also failed sometimes, but finally they accomplished it. God doesn’t want us to be sitters. We cannot earn His grace or forgiveness, but it should inspire us to serve Him. True confession will bring about a heart that seeks to serve God again. 9. Now our God, what shall we say after this? Ezra did not seek to make excuses. What do most people do when confronted with sin? Make excuses. Such as? It wasn’t my fault. I lost track of the time. It’s not a big deal. It’s my brother’s fault. I couldn’t help it. Or my all time favorite from my childhood, “I forgot.” A person who makes excuses has not yet taken responsibility of his sin and confessed. If we say, “I am sorry, but…” it is almost never confession. True confession does not include excuses. 10. In verses 10-12 Ezra reviews the commands God gave them on this issue before entering the Promised Land (review quickly here). Why did he list these commands out? He listed them to admit that they had broken them. In other words, he doesn’t just say sorry for some ambiguous unknown mistakes. He says “You told us not to marry with these pagan nations and we did. We are guilty.” When I was growing up, my parents taught us to apologize when we did wrong. Being the extremely tricky kids we were, we came up with all kinds of “apologies.” Some of these include (of course spoken very quietly), “Sorry if I hurt you.” “Sorry YOU were offended by what I said.” “Sorry.” My parents always made sure that we understood what we had done that was wrong and included it in our apology. Instead of just saying sorry for whatever, say “Sorry I pushed you into the ground and hurt you. Please forgive me.” True confession includes specific areas of failures. 11. In verses 13-14 Ezra acknowledges that God would be perfectly justified in punishing them even more, even to the point of wiping them out for what they had done. In fact, this is one of the reasons this sin disturbs Ezra so much. There was only a small remnant remaining in the land. Many of these had been breaking God’s commandments and corrupting themselves. The nation was in real danger of extinction (either by becoming mixed with all the peoples or because of God’s judgment). They had been given a second chance and Ezra didn’t want to waste it. True confession understands that sin is serious and dangerous. 12. Finally he pointed out God’s righteousness and their own inability to even stand before him because of their sin. There is a sharp contrast between us and God. True confession realizes that God is holy. 2. True confession begins with humility. 3. True confession takes personal responsibility and doesn’t blame others. 4. True confession acknowledges our sin as a stench that God hates. 5. True confession acknowledges all of our past sins. 6. True confession realizes that sin comes with consequences. 7. True confession recognizes and is grateful for the grace of God. 8. True confession will bring about a heart that seeks to serve God again. 9. True confession does not include excuses. 10. True confession includes specific areas of failure. 11. True confession understands that sin is serious and dangerous. 12. True confession realizes that God is holy.